Welcome back Explorers! The tournament may have just ended, but that doesn’t mean it’s time to rest just yet. Today we’re faced against two epics: the Ouranosaurus and Concavenator! They have quite the diverse move set between them, and at max levels, they can do a ton of damage! Join us as we devise a strategy to bring down this duo. This Epic Strike is thankfully not as hard as the Epic Strikes we’ve had last week. However, you shouldn’t underestimate these dinosaurs. They’ve got the potential to rack up some serious damage and are not to be taken lightly. Most of our team has witnessed Ouranosaurus lead and there’s a good chance you will too. Remember though, if you find a need to tackle the battle again, the order may not be the same. Swap-in Dracoceratops/DG2 (be mindful of the damage these guys can do, above level 17 should be sufficient). Gorgosaurus, Postimetrodon, Tryostronix and Indoraptor are all good choices. 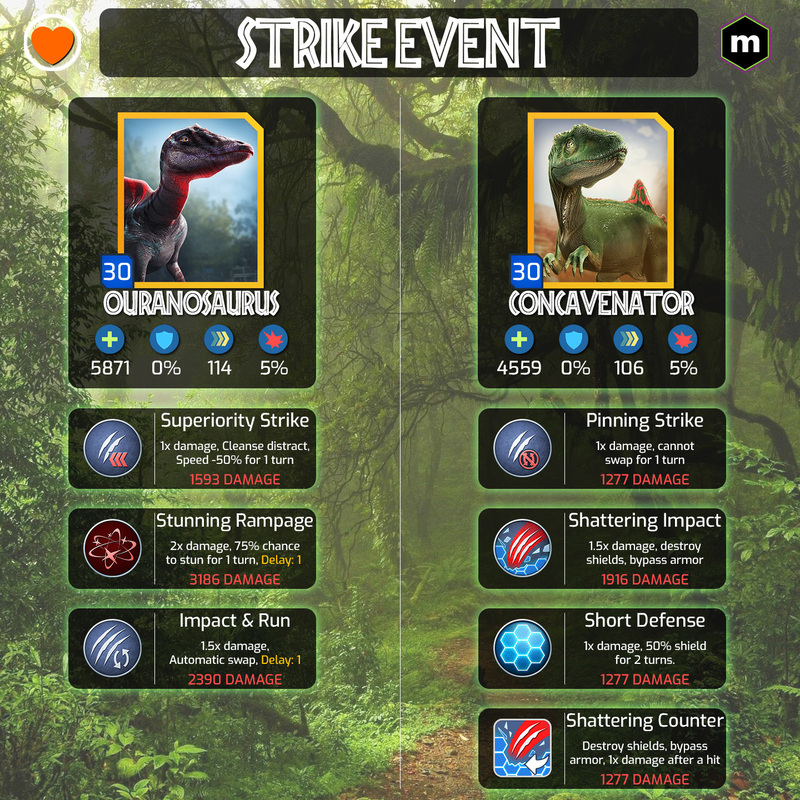 Use Ferocious strike to finish off Ouranosaurus and prepare to unleash some serious damage in the next round! To summarize: Use Lethal Wound (and/or SIA DSR) to bring Ouranosaurus down or at least to its knees, and then finish it off with a revenge killer or another dino that has a powerful delayed move. At level 30, Conk is much scarier than it gets credit for. Concavenator has a massive damage output due to its Defense Shattering Counterattack. It’ll take more than just a big hit to defeat it but if you’ve set up a buffed revenge killer while finishing off Ouranosaurus, you’re on the right track. Rumor has it that Concavenator likely leads with Short Defense, so if your dino only has one defense shattering move, it may be wise to save it for turn 2. Trailing with a speed of only 106, Concavenator is at the sluggish end of the spectrum. Lucky for us, this means there are plenty of ways to counter this counter-attacker. If you did not go the buffed-revenge killer route, then you have one mission: Distract, Distract, Distract! That counter attack will do almost 1300 damage! (and this doesn’t even include its base attack). We can rely on old faithful here: Suchotator is useful with its Instant Distraction + Lethal Wound moveset to limit Concavenators damage output, while still bleeding it in the process. Leading with Lethal Would gives you the most bang for your buck and you can time the Instant Distraction for Conk’s Defense Shattering Impact (likely to be on turn 2). Another plus to using Instant Distraction is that you don’t get hit by the Counterattack. It’s okay to get excited at this point, hopefully victory is not too far away! Other viable options include stunning it with dinosaurs like Sinoceratops, Stegoceratops, Paramoloch or Monostegotops (they need to be at a high level to survive that turn 1 hit though). Once Concaventor is stunned, it’s robbed of its base attack AND its counter-attack. This is a great back up plan to finish off Concavenator. If you’re in the pool of players who were not able to finish off Ouranosaurus before it landed its Impact & Run, these dinos will work well against it when it returns as well. So to summarize: Use an Instant Distraction dinosaur like Suchotator to deal with this one. It reduces Concavenator’s damage enormously while also letting you bleed it in the process. This strike, while not as difficult as the ones last week, should still not be underestimated. These dinosaurs can rack up damage quickly so watch out! But if you use a good strategy and good dinosaurs you should get the job done. Let us know which strategy worked out for you and if you got some good DNA out of it!